Honestly, if I was Hagar, I don’t think this would really be all that encouraging. The fact that she does and says of God: “El Roi. You are the God who sees” really gives us a glimpse into her heart and her attitude at this point. She might have returned to Abraham and Sarah in obedience, but certainly not in humility. Her actions might have been in submission but her attitude… never. React: The people of Islam call themselves the children of Ishmael. I am not going to dig into the doubtful legitimacy of that claim in this devotional. The question deserves a much more thorough and nuanced answer than I could accomplish in a few paragraphs. I am not even going to go into whether, legitimately or not, they have stepped into and taken ownership of this prophecy. This isn’t the love God has called us to live. This is not how He taught us, on a mountainside, to treat our neighbors or even those who declare themselves our enemies. The church rightfully claims to be the spiritual seed of Israel, the child of Isaac, the child of Abraham. Are we? Are we living out this heritage or, with fist raised against the world, are we actually the spiritual son of Ishmael? You taught us to pray that Your Kingdom would come here on earth as it is in heaven. That kingdom is not found in any flag. It does not come through belligerence or even vengeance. It will not be advanced no matter how many millions of dollars worth of bombs we drop or walls we build against those who we mistakenly call our enemies. Your kingdom comes through love, from You, through me, to my world. It comes when I surrender, submit to Your will rather than forcibly impose my own. Rather than living with fist raised in opposition, let me lived with arms outstretched in welcome to the world. Let me live like You did. Thank you for your insights and message. I agree. Love Wins. Thank you for your insightful thoughts. 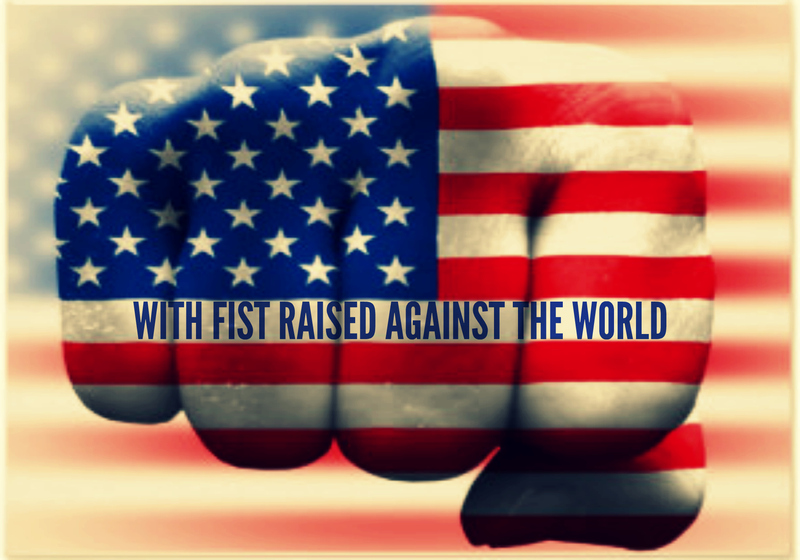 Within the U.S. the right and the left have fists raised against each other, and Jesus followers are the best potential catalysts for bringing about reconciliation of differences and unity of purpose and action. Wonderful prayer. I have never been ashamed in my 69 years to call myself American until now. May God help us. Your words are perhaps what many of us wanted to say at one time or another. Now you have written them for some who hesitated like I. Thank you.